“The ecosphere is observably, demonstrably dying around us. Everyday life is increasingly ordered by technologies most of us do not understand — and in the case of artificial intelligence, cannot understand, even in principle. A vanishingly small number of plutocrats and oligarchs lay claim to virtually all of the wealth produced on Earth, as the rest of us are forced to accept the baleful truths of a life defined by precarity. The far (and in some places the extreme) right run rampant everywhere from Brazil to Hungary to the Philippines, deftly capitalizing on the sense of helplessness and powerlessness generated by these implacable circumstances. “In this introduction, municipalism is presented to the reader as a cluster of related tactics and techniques that allow a community embracing them to ascend the rungs of Sherry Arnstein’s ‘ladder of citizen participation,’ from manipulation through consultation to citizen control. As Arnstein suggests, the point of increasing the intensity of involvement in decision-making is to grasp power, and the testimony of those who have experienced such power as a lived reality attests to the wide array of beneficial social, psychic and ecological effects that follow. The book visits Porto Alegre, Chiapas, the ZAD of Notre-Dame-des-Landes, Athens, Brooklyn, Barcelona and Jackson, Mississippi to see what lessons each of them can teach us about the organization of autonomous communities; moves through an extended discussion of the Rojava achievement; and concludes by taking a stab at articulating what all of this might be leading up to. I’m curious to know what you think ought to be included in a book of this nature, and especially what you think I might be missing. I have to say, though, that I can’t remember ever having been as excited about a book project. This is the one I’ve wanted to write for almost a decade now. I’ll keep you in the loop as to how I’m getting along with it. Of such moments is a happy life made. Once again, a note of cheer for those of you who may have suspected from time to time that all your creative efforts are in vain: this chart from a blathering McKinsey white paper on global adoption of “smart city solutions” acknowledges my 2013 pamphlet “Against the smart city” as part of an inflection point in the discourse. Think about that for a second — I mean, I sure did, for well more than a second, and you can be equally sure it’s a thought I’ll return to in less affirmative moments. What we’re talking about here is a slim, self-published missive, written by an unaffiliated, uncredentialed independent, taking to task the offerings of hugely well-funded, global enterprises like IBM, Siemens, Hitachi, Cisco and Microsoft, and being cited by an equally global and well-resourced management consultancy as having helped blunt the force of their drive toward hegemony. That the pamphlet in question was aided immeasurably by the simplemindedness, mendacity and brittleness of the things it set out to critique is beyond any doubt: you don’t need to wield much of a battering ram, after all, if all you’re trying to do is knock down a house of cards. Let’s be equally clear that by far the greater part of the c. 2014-15 retrenchment in corporate smart-city rhetoric stemmed from the fact that the multinationals found, to their great chagrin, that there simply wasn’t a viable high-return business model for what they’d been peddling. And finally, let’s not discount the influence of the multiple kinds of privilege I enjoyed (and continue to enjoy) in shaping the pamphlet’s reception. Those factors were all surely in play. But the lesson I derive from this experience is that at least some of the asymmetry and access to leverage those of us who were there cherished about the early Web remains a fact of the world — a fact that other uncredentialed, unaffiliated, independent actors can grasp and turn to their own advantage, whatever the flavor of their own particular struggle. It’s not every day you wake up and see you’ve been given even partial credit for forcing Behemoth to alter its plan of attack, by a party granted all the credibility to perform such acts of discourse policing and consensus formation, and hope that the world is made that infinitesimal amount freer and more just as a result of your actions. As silly as this may certainly be, it’s also a gratifying and a sustaining thing. Know then that your pamphlet (mixtape, rant, supercut, outfit, etc.) can move mountains, if only by that much and only for awhile. I hope that more of you get to experience what that feels like — or still better, experience the reality of your impact for yourself, perceive it with your own senses instead of relying on some bottom-feeding consultancy to reaffirm what you already know to be true. PETTY UPDATE: I get a huge, if somewhat cruel, kick out of seeing the McKinsey cats identify the June ’16 launch of Y Combinator’s New Cities initiative as a landmark moment in the triumphant return to credibility of the smart city. Headed up by the useless Ben Huh, New Cities appears to have been stillborn, with its blog featuring no activity to speak of since its initial announcement of intent, and a grand total of two posts on the associated research portal over the subsequent two years (one of which is a repost of the launch announcement). It really takes an impressive amount of intellectual dishonesty to anoint this as a milestone in anything but the annals of FAIL. I’m fairly sure that I share with most other writers the uneasy sense that every word issuing from my keyboard ultimately flies off into the great void. I go to sleep at night safe in what is surely the statistically reasonable belief that the things I write are at best parsed quickly, in a state of distraction, and never really land in any meaningful way. This isn’t occasion for bitterness or resentment, mind you. It’s just the inevitable consequence of living in a time of massive informational overload. There’s such fierce competition for each precious increment of attention, and the kind of things I write about, by their very nature, have a hard time crowding out other claims. It’s something you learn to accept if you hope to face the world with anything like equanimity, let alone cheer. 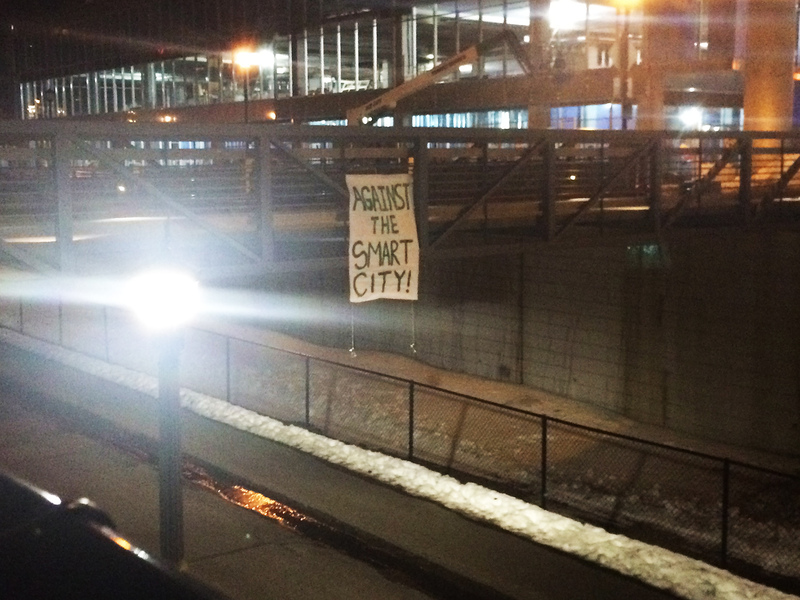 Maybe this is why I felt such a gut-deep thrill at learning that some Minnesota activists opposed to the testing of a new autonomous shuttle hung this banner from an overpass last night. If nothing else, it suggests that at least some of what I tried to express in “Against the smart city” escaped the abyss, and managed to register somehow. I’m sure this is laughably small potatoes from the perspective of anyone whose contributions actually do shift the global discourse, but for a decidedly non-A-list writer, such evidence of impact is supremely gratifying. I am — naturally, because this is me — ambivalent about the idea that my work can be mobilized in the context of this specific protest. I think it’s far from clear that autonomous mobility will necessarily drive the oppressive métro, boulot, dodo cycle of late capitalism, as this particular protest assumes, and that there’s a decent argument to be made that if properly designed, it will physically concretize the right to the city in a way few other modes of getting around have ever been able to — particularly for citydwellers of limited personal mobility. Nevertheless, that “if properly designed” is a major stumbling block, it’s far too late in the day to place any stock in the good will or benevolent intentions of would-be technological disruptors, and in any event, intent isn’t magic. People are right to question every aspect of the propositions they’re confronted with by smart-city advocates — to question, ascertain whether what is to be installed accords at any point with their needs and desires, and protest, disrupt and prevent the deployment of anything that does not. And that very much includes mobility systems whose designers cannot adequately justify the thing they have conceived, either to their intended audience, or to the communities through which their infrastructure runs. At present, I don’t know enough about the Hennepin County autonomous-mobility test to determine whether or not I personally would oppose it. But then, I don’t live there. It’s enough for me to know that at least some of the people who do have yet to be convinced that it’s anything but a harbinger of exploitation and oppression yet to come. I’m delighted, and deeply gratified, to see my words invoked in their struggle. PS If anyone responsible for this banner should happen to see this, please do get in touch — anonymously, if you prefer. I’d love to hear from you. With Radical Technologies finally out and — to my amazement and deep satisfaction — receiving the most extraordinarily generous notices, I think it’s a good moment to pause, take a breath, and take stock of how it is that I’ve rolled up on these shores. In the course of a life, if you’re very lucky, you run into people who through their words and deeds launch you on a completely new and better trajectory than the one you arrived on. There’s actually quite a bit more than luck involved, of course; one of my favorite definitions of “privilege” glosses it as a state in which your personal networks tend to help you achieve your ambitions, rather than suppressing or undermining them. But there’s unquestionably room in all of this for the operations of chance. Looking back now, I can see a few clear and obvious inflection points in the journey that resulted in me being able to write and publish Radical Technologies, and without exception they were moments at which a specific individual human being intervened in my life in a conscious attempt to change my fortunes for the better. And what strikes me with particular force is how contingent all of these encounters were. They so easily could have gone another way — any other way. And had that been the case, it is overwhelmingly likely that my life as I know it wouldn’t exist. What follows, then, is my (no doubt flawed and incomplete) attempt to name and thank these human beings for making the decisions they did. I want them, and you, to know that wonderful things happened in the aftermath of those choices. I thought you might enjoy seeing the draft index I compiled for Radical Technologies, now available for pre-order on Amazon. If nothing else, it’ll give you an idea of the book’s main concerns, and maybe even a sense of its arguments. Radical Technologies launches worldwide on May 30th, 2017. The other night I selected-all in a file on Google Docs and turned the entire text bright red. This was my signal to my editor Leo that I’d made the final round of edits on the last outstanding chapter I owed him. And this, in turn, means that after eight years and eleven months, I’m finally done with the project I started in this blog post. I’ve finished my book. It is, in too many ways to count, a different book from the one I set out to write. I owe most of this to Leo, actually. Do you know the scene in Inception where Joseph Gordon-Levitt and Tom Hardy, as intruders in the virtual world of another man’s mind, are under assault by the ghostly brigades of their subject’s “militarized subconscious”? Gordon-Levitt’s character is standing at the door of a warehouse, plinking away ineffectually at the encroaching horde with an assault rifle, when Hardy shoulders him aside. With the words, “You mustn’t be afraid to dream a little bigger, darling,” he hoists a massive South African grenade launcher, lobs a round onto the opposite rooftop, and blows things up reeeeal good. It put the zap on my head so hard that I didn’t get any further work done on the book for a good six months. I don’t know what it’s like for you. I won’t presume to say I understand anyone else’s interiority, or process, or approach to their work. I imagine that there are some creators who are safely armored by a transcendent belief in their own talent, who glide through pitches and contracts and reviews lubricated by a sense of inevitability and rightness. I’m not one of those people. So in a way, what Leo did to me was cruel. But it also led directly to a change of title, a change of scope, and a much bigger and more ambitious book. What had started out as a rather constrained proposition turned into a sprawling survey of some of the major ways in which networked information technologies shape the choices arrayed before us. I should be clear that it probably misses as much as it gets right; I have a sustained history of focusing too much on the wrong aspects of a technology, or at least not the aspects that turn out to be most salient to our understanding of it, and I’m not sure it’s any different here. I’m also a little gutted to have written a book that’s so obviously and prominently about information technology. As I’d originally envisioned it, this was supposed to be a decisive pivot away from all of that, and toward the thing I care more deeply about, which is the life of cities. But as Nurri always reminds me, there are any number of writers in the world who have deeper or more original insight into cities. It just isn’t what people seem to want from me. After awhile, if you’re smart, you listen to what the world tells you about what it wants from you, with intense gratitude that it appears to want anything at all. So: Radical Technologies: The Design of Everyday Life, now available for pre-order. In its ten chapters, I take up some of the recent and emerging technical developments that now condition the way we experience the everyday, just about everywhere on Earth. I start with the smartphone, ready-to-hand as it is, and continue on to augmented reality; the so-called internet of things; 3D printing, CNC milling and other digital fabrication technologies; cryptocurrency and the technology underlying it, the blockchain; and finally the constellation of practices and ideas that is dedicated to the eclipse of human discretion, and includes machine learning, the automation of work and artificial intelligence. I spend some time considering the ways in which these discrete techniques are brought together in particular ensembles and commercial value propositions — and by whom, and particularly toward what ends — and finish up by asking if there’s a space for tactics or even resistance available to us in any of this. All in all, I think it’s turned out rather well. Most writers say something along these lines, but it’s really true and I really do mean it: though I take full responsibility for whatever infelicities and misapprehensions remain, just about all the good in this book arises from the conversations I’ve had with you. It’s not — and I’m not — Lefebvre, but that’s OK. It’s not half-bad. I don’t think I’ll ever stop being grateful. I’m rather fond of the title, by the way. It’s ambitious, a title to conjure with. It has a certain amount of what the Rastafarians used to call Dread. I don’t know if the book I’ve written really deserves a title like that, but I guess you’ll let me know, won’t you? Thanks to those of you who came along for the ride — especially those who’ve stuck with me all the way from that first blog post, when I was promising you a self-published book called The City Is Here For You To Use, and it was 90% a reaction to the incompetence of my first publisher. Thanks doubly to the 859 of you (!) who ponied up to pre-order that book, most of you in the weeks immediately following the project’s announcement, and who had to wait until the last quarter of 2013 to get your hands on anything resembling the thing you’d ordered. Thanks, eternal thanks, to Leo Hollis, for kicking out the jams. And thanks always to Nurri for sticking with me through all the chicanes and blind alleys of this endless, endless project. Let’s see what happens now. Those quibbles aside, I’m pleased with the way it stands up — pleased enough, at any rate, to offer it to you here, now, before any more time goes by. As ever, I hope you enjoy it and find it usefully provocative. Imagine trying to apprehend everything that happens over the course of a single day, in any of Earth’s great cities: all the flows of matter, energy and information; all the happenstance connections which come into being for a single moment, before passing forever into history; every sensible event which transpires. Even if you could somehow capture all of these passages in a single diagram, how could the result be anything but a writhing hypershape, forever absconding from our ability to comprehend it? But what if we could perceive the shape of events, even for a moment? Better yet, what if we could somehow decode what it was trying to tell us? What if we could divine the subtle patterns latent in it, haul ashore from this dark sea order, insight…meaning? Toward the end of his long and productive career, the great sociologist Henri Lefebvre took up just this question, in a project he called “rhythmanalysis.” This was a notion he introduced in an essay called “Seen from the Window,” and a famous passage in which Lefebvre simply stands at his balcony and gives himself up to the tides of the living city. His view must have been spectacular. From this favored vantage point, he can take up the Centre Pompidou, the Bank of France, the National Archive, “[a]ll of Paris ancient and modern, traditional and creative, active and idle” in a single sweeping gaze. Alongside Lefebvre, we stand at the window long enough to note the diurnal washes of office workers and schoolchildren, the cyclic peaks and troughs of vehicular traffic, the blooms of tourist-friendly mummery in the museum plaza and the slow ebbing of activity into the long stretch of the deep middle night. This depiction of the great city’s surges and stutters is vivid enough, especially for readers familiar with Paris. But what Lefebvre is trying to call our attention to is what happens when we immerse ourselves in the art of watching. “Seen from the Window” isn’t ultimately concerned with anything that can be captured by a single glance, as much as it is with an order that reveals itself only in time. While it certainly resonates with other attempts to know the city via concerted application of the senses, notably Georges Perec’s lovely 1974 Attempt At Exhausting A Place In Paris, this is something Lefebvre maintains even though “Seen from the Window” apparently postdates a few artifacts demonstrating how much more rewarding this undertaking can be when augmented with appropriate technology. Koyaanisqatsi, for example, which is nothing if not a sequence of images showing the rhythm of urban place and the underlying social order, and an extraordinarily vivid and memorable one at that. Or William H. Whyte’s wonderful 1980 investigations of sidewalk life in New York City, released as a short film called The Social Life of Small Urban Spaces. It is surely the case, historically, that time-and-motion studies have had unfortunate Taylorist and Fordist resonances, and perhaps Lefebvre was reacting to those in insisting on the primacy of human perception. But Whyte’s work demonstrated that, conscientiously applied, time-lapse photography could reveal patterns of use and activity that would have escaped the unaided human observer; if the value of such techniques wasn’t obvious before his films, it certainly should have been thereafter. So while I’m always tempted to submit to Lefebvre’s passionate humanism, the fact is that any attempt to understand patterns of regular activity in anything as compound in its complexity as a city is likely to fail if the proper tools are not brought to bear on it. Could it be that we now have access to tools that Lefebvre lacked? Tools that even he might have granted would provide crucial support to his project of rhythmanalysis and, more broadly, other attempts to divine the deeper order in the surging and cycling of things? Certainly those of us with the ordinary endowments of attention and focus have a hard time wrapping our heads around the “organized complexity” Jane Jacobs thought of as emblematic of urban place; I can tell you from long experience that sitting and watching a city, straining to read its traces and signs, is an exercise in head-flexing frustration. I, at least, need help. Consider that organized complexity, and what it implies about the dynamics of place. In any settlement worthy of the name “city,” a very large number of discrete events will transpire at any given moment. We can think of each as a move in a sprawling, elaborate game — but a game in which every move changes the rules all players must abide by. Each and every event that is seen to occur alters the terms of the shared situation, however incrementally or subtly, and anyone wanting to develop any particularly robust understanding of that situation needs to account for as many of them as possible. For most of human history, this was well beyond the capabilities of even the most ambitious state, or enterprise. As we’ve seen, however, we are by now collectively well-embarked on the project of installing sensing devices both on our persons, and throughout the urban environment, that can capture these fragile traces before they are lost. These devices operate in a bewildering profusion of registers, and at every scale. They generate the most torrential volumes of data about our bodies, our places, and everything that happens in and between them. In being uploaded and propagated across a network, the flickering traces of our existence acquire an uncanny persistence. If this persistence isn’t immortality, or anything like it, it is at the very least an extension in time of things we have generally expected to expire and disappear from the world entirely. Whatever is once captured by the network remains available for future retrieval, furnishing us with a repository of collective memory that another French thinker, Bernard Stiegler, thinks of as a “global mnemotechnic apparatus.” And where the flood of sensed impressions easily overwhelms any unaided ability to make meaning of it, we now have access to an array of analytical techniques to help us correlate, synthesize and extract significance from the intake. Where Lefebvre maintained that only the human eye was capable of registering the city’s rhythms, and only the human heart truly able to make sense of them, we’ve bound ourselves and our cities in a skein of technical mediation that — in this sense, anyway — allows us to transcend the limitations of the merely human. In doing so, we acquire new and almost superhuman capabilities, collectively and individually. We can sift the onrushing flow of events, divine the presence of a signal amidst all the noise, develop a vastly refined understanding of a city’s organized, compound and ramifying complexity…and act upon it. Lefebvre is gone, but his balcony remains. The city that stretches beneath it is, like all other true cities, a manifold positively shuddering with life and activity at every scale of being. It pulses with flows of matter, energy and information, in patterns that vary from the clockwork-routine to the one-of-a-kind and never-to-be-repeated. What would you miss, if all you could know of these flows was the wedge or cone visible to you during a few hours’ vigil at a window in the 6e? It’s a few moments before six, on a damp evening in early spring. From Montreuil in the east to Neuilly-sur-Seine in the west, streetlights wink on in a slow wave, as their sensors register the falling dusk. There’s a rush-hour backup approaching the Porte d’Orléans exit on the Périphérique; in front of a BNP Paribas ATM in the Rue de Sèvres, a brief scuffle breaks out between supporters of the Paris Saint-Germain and Olympique de Marseille football clubs. Two friends from Sciences-Po laugh abashedly, as they recognize one another before one of the few tatty multiplexes remaining on the Champs-Élysées — they’re in line to pick up tickets for the 6:15 showing of an American blockbuster. Not far away, in the Avenue Carnot, a flic pins a suspected purse-snatcher to the wall; affecting nonchalance as they wait for a van to come pick them up, he leans into the man’s back, putting all his weight behind the point of his elbow. A municipal street-cleaner churns slowly through the streets of the Marais, hosing the day’s grit and dust from the asphalt. Across town, on the Boulevard Ney in the 18e Arrondissement, a bored Ghanaian streetwalker seeks shelter from a brief downpour beneath the awning of a pharmacy, her emerald-daubed nails clacking on the screen of her phone as she checks her messages. In the Rue Saint-Honoré, a fashion executive urges her two matched Standard Poodles from the back of the black S600 that has just deposited her in front of her office. An American backpacker on a post-collegiate month abroad strides forth from the marble gate of Père Lachaise with a shoplifted Gide wedged in the cargo pocket of his fatigue pants. And way out in Torcy, there are RER cars being switched in from a siding to the main rail line, bound for Les Halles and the other stations of the center. In this city, everyone passing by with a mobile phone reveals their location — whether or not the phone is equipped with explicitly locative technology, whether or not the phone is even turned on. Every transaction in the bistros and shops and cafés generates a trail, just as every bus and car and Vélib bicycle throws its own data shadow. Even the joggers in the Bois du Boulogne cast a constant, incrementing tally of miles logged and calories burned. This is Paris: all of it, all at once. In any previous epoch, all of these events might have transpired unobserved and unmarked — except, perhaps, by a sociologist in the twilight of his life, gazing down from his balcony. Even the most sensitive observer could never hope to witness or impress upon their recollection more than the tiniest fraction of it, however long they watched the city go by. And any information or potential insight bound up in the flow of events fell to the ground like a silent, diffuse drizzle, forever lost to introspection, analysis, and memory. But now we can trace these flows, at least in principle, and plot them in space and in time. We can turn up latent patterns and unexpected correlations, and in turn suggest points of effective intervention to those with a mind to change. We can determine that there are more rhythms in the living city than even Henri Lefebvre ever dreamed of: anticipations, reversals, slight returns. Stutters, stops, and lags. Doublings and crashes. And we can do this all because of the vast array of data-collecting devices we’ve seeded through the quotidian environment. Traffic cameras and roadway sensors on the Périphérique log the slowdown, and it shows up as a thick red line splashed across a hundred thousand electronic roadsigns, dashboard navigation units and smartphone screens. Here are the rhythms of daily mobility and, by extension, the broader economy. The ATM’s security camera captures the precise details of who did what to whom in the scuffle, and when; the identities of the participants can be reconstructed later on, if need be, by a state-sanctioned trawl of the transaction records. (Those identity files will almost certainly note an individual’s allegiance to a particular football club.) As with the traffic, here too we can begin to make correlations, mapping outbreaks of aggression against other observed phenomena — the league schedule, perhaps, or the phase of the moon, or the unemployment index. Or even something comparatively unexpected, like the price of discount-airline tickets. Here are the rhythms of collective mood. The friends so embarrassed to run into one another at a superhero movie? They reserved their tickets online using their phones, and in so doing broadcast their choice for all to see, at least in aggregate; they might be surprised to learn that those who purchase tickets in this way in the streets around their campus appear to have a marked fondness for Hollywood action flicks. Here are correlated geographical patterns of socialization and consumption, and the rhythms of media consumption. The Avenue Carnot is nowhere to be found in any official record of the bag-snatching incident. In all the relevant entries, the offense is associated with the location where it was reported, a few blocks away in the rue de Tilsitt, and so that is how it shows up in both the Mairie’s statistics and a citizen-generated online map of risk in Paris; in fact, this kind of slippage between an event that happens in the world and the event’s representation in the networked record is routine. But the arrogant insouciance of the arresting flic’s posture bothers a lycée student passing by, who snaps a picture with her phone and submits it, time- and location-stamped, to the Commission Citoyens Justice Police, a civilian review board. In this constellation of facts, we can see something about the frequency with which particular kinds of crimes are committed in a given location, the type and density of policing resources deployed to address them, and the frictions between the police and the communities in which they operate. Here, then, are the contrapuntal rhythms of crime, its control and the response to that control. The streetcleaner, of course, has a GPS transponder; its moment-to-moment route through the city is mapped by the Mairie itself, and provided to citizens in real time as part of a transparency initiative designed to demonstrate the diligence and integrity of civil servants (and very much resented by the DPE workers’ union). Unless prevented from happening — should those workers, for example, happen to go on strike, or a particularly rowdy manif break out — here are the metronome-reliable rhythms of the municipal. The fashion executive had her assistant reserve a car online some weeks ago, and so while there’s certainly something to be inferred from whether she splurged on the S600 as usual, or economized with a cheaper booking, there’s probably some lag in what it signifies. (Even if the car hadn’t been booked on the corporate account, it is also, of course, equipped with GPS, and that unit’s accuracy buffer has been set such that it correctly identifies the location at the moment it pulls up to the curb with the name of the house the executive works for.) Here can be gleaned solid, actionable business intelligence: both the cycling of particular enterprises and sectors of the economy, and by extension possibly even some insight into the rhythms of something as inchoate and hard to grasp as taste. What might we learn from the American backpacker? The pedometer app on his phone is sophisticated enough to understand his dwell of eleven minutes in a location in the Rue de Rivoli as a visit to the W.H. Smith bookstore, but other facets of his activity this day slip through holes in the mesh — that boosted volume of Gide, notably, which will remain an unexplained lacuna on the bookstore’s inventory-tracking software. And, bizarrely, his few hours contemplating greatness and mortality in Père Lachaise, which resolve against a flaky location database as having been passed instead in the aisles of a Franprix market a few blocks to the east. (Indeed, so often does this same error happen that after a few months, the Franprix starts getting recommended to other tourists as a destination frequently visited by people like them, and enjoys a slight but detectable bump in revenues as a result. The manager is pleased, but mystified.) Here are the rhythms of contingency and chance and stochastic noise. And each commuter passing through the turnstiles of the RER at day’s end, each of them the increment of a register in the capacity-management systems of the RATP, clarifies the contours of one final picture. The city’s population at 4 AM may be half what it is at 4 PM, revealing the true Paris as something that has only a casual relationship with its administrative boundaries. Here is the rhythm of the city itself. Where previously everything that transpired in the fold of the great city evaporated in the moment it happened, all of these rhythms and processes are captured by the network, and retained for inspection at leisure. We can readily visualize basins of attraction or repulsion, shedding light on the relationships between one kind of flow and another, and in so doing perhaps learning how to shape their evolution with a lighter hand. By the same token, though, that which had been liminal becomes clear; what was invisible is made self-evident, even painfully obvious; the circumstances we generally prefer to ignore or dissemble stand forth, plain as day. The embarrassing, the informal, the nominally private and the illegal become subject to new and perhaps untenable kinds of scrutiny. The gaze of the state intensifies — but the state may find, to its surprise, that its subjects have many of the same capabilities, and are gazing right back upon it. On this evening in the City of Light, a hundred million connected devices sing through the wires and the aether. Of the waves that ripple through the urban fabric, at whatever scale, very few escape their ken — escape being captured by them, and represented in bursts of binary data. Enciphered within are billions of discrete choices, millions of lives in motion, the cycling of the entire economy, and, at the very edge of perception, the signs and traces of empire’s slow unwinding. This is a city Lefebvre never saw from his balcony, and never could — any more than Henry Mayhew could have, in looking down on the wild scrum of Victorian London from the parapet of St. Paul’s, or any observer of any of the great cities of history would have been able to, no matter the perspicacity they brought to the task. It’s ours, the one we live in. What might we do with it? This is turning into a week of posts that begin “It gives me great pleasure…”, isn’t it? Well, forgive me: it does actually give me great pleasure to share with you the news that our pamphlet “Against the smart city,” the first part of The city is here for you to use, is now available for purchase in a Kindle edition. I hope you enjoy it. Additionally, if you’re among those who pre-ordered The city is here for you to use lo those many years ago, I’d like to ship you a copy of the pamphlet gratis as a way of thanking you for your patience. If you haven’t gotten an email to that effect from me recently, I may not have your current address, so if you’ll drop me a line and let me know where I can reach you, I’ll send you your copy immediately. You may have noticed, as well, that this is published through our Do projects initiative, which means that every penny we garner in commission goes directly toward supporting our ability to produce work like this, Nurri’s Tokyo Blues, and other inquiries at the intersection of urbanism and everyday life. So please do share widely. Many thanks! Now that we’re finally slouching toward Amazon to be born — i.e. I’m confident that the Kindle edition, at least, will ship within the next ten days — I’m happy to be able to share this final bibliography for “Against the smart city.” I hope, as ever, you find it useful. Alcatel-Lucent Corporation. “Getting Smart About Smart Cities: Understanding the Market Opportunity in the Cities of Tomorrow,” February 2012. Alexander, Steve. “IBM wants Minneapolis to become a ‘smarter city,'” Minneapolis Star Tribune, 6 June 2011. Allease, Eve. “Abu Dhabi, United Arab Emirates: Future Green City Now,” Urban Times, 22 May 2011. Allianz Open Knowledge Initiative. “Masdar City: a desert utopia,” 30 March 2009. Alusi, Annissa, Robert G. Eccles, Amy C. Edmondson and Tiona Zuzul. “Sustainable Cities: Oxymoron or the Shape of the Future?,” Harvard Business School Working Paper 11-062, 20 March 2011. Amnesty International. “Amnesty International Report 2008: Americas Regional Update. Selected events covering the period from January to April 2008,” 28 May 2008. — “‘We have come to take your souls’: the caveirão and policing in Rio de Janeiro,” 13 March 2006. Beer, Stafford. Platform for Change: A Message from Stafford Beer. Wiley, New York, 1975. Bell, Genevieve and Paul Dourish. “Yesterday’s Tomorrows: Notes on Ubiquitous Computing’s Dominant Vision,” Personal and Ubiquitous Computing Volume 11 Issue 2, January 2007. Bettencourt, Luís M.A., et al. “Growth, innovation, scaling, and the pace of life in cities,” Proceedings of the National Academy of Sciences, Volume 104 Number 17, 24 April 2007. Biddle, Sam. “Racial Profiling: Newest Trend in Silicon Valley?,” Valleywag, 7 August 2013. Black, Edwin. IBM and the Holocaust: The Strategic Alliance between Nazi Germany and America’s Most Powerful Corporation, Random House, New York, 2001. Boudreau, John. “Cisco helps build prototype for instant cities,” San Jose Mercury News, 01 June 2010. Brand, Stewart. How Buildings Learn, Viking Press, New York, 1994. Brewster, Kent. “Profiling Atherton,” July 2013. Carlisle, Tamsin. “Masdar City clips another $2.5bn from price tag,” The National, 1 December 2010. Chalmers, Matthew and Ian MacColl. “Seamful and Seamless Design in Ubiquitous Computing,” Technical Report Equator-03-005, 2004. Chen, David W. “Survey Raises Questions on Data-Driven Policy,” The New York Times, 8 February 2010. Chomsky, Noam. “The Case Against B.F. Skinner,” New York Review of Books, 30 December 1971. Cisco Systems. “Cisco and Lake Nona Unite to Create First U.S. Iconic Smart+Connected Community in Orlando, Florida,” 24 October 2012. — “Cities of the Future: Songdo, South Korea,” 2012. — “Cities of the Future: Songdo, South Korea – Living,” 2012. — “Cities of the Future: Songdo, South Korea – Roadmap for a New Community,” 2012. — “Smart City Framework: A Systematic Process for Enabling Smart+Connected Communities,” September 2012. City Mayors Foundation. “Largest cities in the world ranked by population density,” 2007. Cohen, Boyd. “Singapore Is On Its Way To Becoming An Iconic Smart City,” Fast Company co.Exist, 14 May 2012. Le Corbusier. The Athens Charter, Grossman Publishers, New York, 1973. — La Ville Radieuse. Editions Vincent, Freal & Co., Paris, 1935. Cotton, Brian (“Ph.D.”!) for Frost & Sullivan. “Intelligent Urban Transportation: Predicting, Managing, and Integrating Traffic Operations in Smarter Cities. CSIR-Central Road Research Institute. “Evaluating Bus Rapid Transit (BRT) Corridor Performance from Amebedkar Nagar to Mool Chand Intersection,” 13 February 2013. Davis, Mike and Daniel Bertrand Monk. Evil Paradises: Dreamworlds of Neoliberalism, The New Press, New York, 2008. De la Peña, Benjamin. “Embracing the Autocatalytic City,” The Atlantic Cities, 11 March 2013. Deleuze, Gilles. Cinema 1: The Movement-Image, Athlone Press, London, 1986. Dourish, Paul. Where the Action Is: The Foundations of Embodied Interaction, The MIT Press, Cambridge MA, 2004. The Economist. “Masdar plan,” Technology Quarterly, 4 December 2008. Economist Intelligence Unit for Siemens AG. “Managing the city as a ‘living organism,'” Asian Green City Index, 2011. Emirates Center for Human Rights. “Migrant workers in the United Arab Emirates,” July 2012. English, Bella. “He’ll Build This City,” Boston Globe, 13 December 2004. Executive Affairs Authority, Emirate of Abu Dhabi. “Law No. 22: Establishment of Abu Dhabi Future Energy Company and Masdar Institute of Science and Technology,” 2007. Feuer, Alan. “Occupy Sandy: A Movement Moves to Relief,” The New York Times, 9 November 2012. Flood, Joe. The Fires: How a Computer Formula Burned Down New York City — And Determined the Future of American Cities. Riverhead Books, New York, 2010. Forrester, Jay. Urban Dynamics, The MIT Press, Cambridge MA, 1969. Frayssinet, Fabiana. “Forced Eviction from Rio’s Slums Echoes Dark Past,” Tierramerica, 10 May 2010. Galbraith, Jay R. “Matrix organization designs: How to combine functional and project forms,” Business Horizons Volume 14 Issue 1, 1971. Gartner, Inc. “Is ‘Smart Cities’ The Next Big Market?,” 2010. Gehl, Jan. Life Between Buildings: Using Public Space, trans. Jo Koch, Van Nostrand Reinhold, New York, 1987. Gibson, William. Neuromancer, Ace Books, New York, 1984. Green, Jeremy for OVUM. “Digital Urban Renewal,” April 2011. Greenfield, Adam. “Preliminary Notes to a Diagram of Occupy Sandy,” Speedbird, 21 November 2012. — Everyware: The dawning age of ubiquitous computing, New Riders, Berkeley, 2006. Gunther, Marc. “A Photo Tour of Masdar City,” Greenbiz.com, 21 January 2011. Hatch, David. “Singapore Strives to Become ‘The Smartest City,'” Governing, February 2013. Hedlund, Jan for Microsoft Corporation. “Smart City 2020: Technology and Society in the Modern City,” March 2011. Hitachi, Ltd. “Coordination of Urban and Service Infrastructures for Smart Cities,” 2012. — “Telecommunication Systems for Realizing a Smart City,” 2012. Howard, Ebenezer. Garden Cities of To-morrow, Faber and Faber, London, 1902. Human Rights Watch. “World Report 2012: United Arab Emirates,” January 2012. IBM Corporation. “City Government and IBM Close Partnership to Make Rio de Janeiro a Smarter City,” 27 December 2010. — “Intelligent Operations Center,” 6 March 2012.
International Data Corporation. “Worldwide Quarterly Enterprise Networks Tracker: Top Five Worldwide Layer 2/3 Ethernet Switch Vendors,” 23 August 2012.
International Telecommunication Union. “Living In a World of 7 Billion People: Digital Cities for a Better Future,” ITU News, August 2011. — “The World in 2013: ICT Facts and Figures,” February 2013. Jacobs, Jane. The Death and Life of Great American Cities, Random House, New York, 1961. Kitchin, Rob and Martin Dodge. Code/Space, The MIT Press, Cambridge MA, 2011. Koetsier, John. “Cisco helps build first U.S. ‘Smart+Connected’ city of the future in Lake Nona, Florida,” VentureBeat, 23 October 2012. Kolesar, Peter. “Model for Predicting Average Fire Company Travel Times,” RAND Institute report R-1624-NYC, June 1975. Koolhaas, Rem. “The Generic City” in S, M, L, XL, The Monacelli Press, New York, 1994. Lee, Junho and Jeehyun Oh. “New Songdo City and the Value of Flexibility: A Case Study of Implementation and Analysis of a Mega-Scale Project,” MS thesis Massachusetts Institute of Technology, 2008. Lindsay, Greg. “Building a Smarter Favela: IBM Signs Up Rio,” Fast Company, 27 December 2010. — “Cities in the Cloud: A Living PlanIT Introduction to Future City Technologies,” July 2011. — “Living PlanIT at Cisco C-Scape,” July 2011. Masdar City. “Frequently Asked Questions,” 2011. — “Masdar City: The Global Center of Future Energy,” 2011. McCullough, Malcolm. Digital Ground: Architecture, Pervasive Computing, and Environmental Knowing, The MIT Press, Cambridge MA, 2004. Medina, Eden. “Designing Freedom, Regulating a Nation: Socialist Cybernetics in Allende’s Chile,” Journal of Latin American Studies Volume 38 Issue 3, 2006. Mehta, Suketu. “In the Violent Favelas of Brazil,” New York Review of Books, 11 July 2013. Microsoft Corporation. “Microsoft and Living PlanIT Partner to Deliver Smart City Technology Via the Cloud,” 22 March 2011. — “The Smart City: Using IT to Make Cities More Livable,” December 2011. Migurski, Michal. “Visualizing Urban Data,” in Beautiful Data: The Stories Behind Elegant Data Solutions, Toby Segaran and Jeff Hammerbacher, eds., O’Reilly Media, Sebastopol CA, 2012, pp. 167-182. — “Oakland Crime Maps X,” tecznotes, 3 March 2008. Mitleton-Kelly, Eve. “Ten Principles of Complexity & Enabling Infrastructures,” Complex systems and evolutionary perspectives on organisations: the application of complexity theory to organisations, Elsevier Science Ltd, Oxford, 2003. Mlot, Stephanie. “Microsoft CityNext Aims To Build ‘Smart Cities’,” PC Magazine, 11 July 2013. Montavon, Marylène, Koen Steemers, Vicky Cheng and Raphaël Compagnon. “‘La Ville Radieuse’ by Le Corbusier once again a case study,” The 23rd Conference on Passive and Low Energy Architecture, 6 September 2006. Mostashari, Ali, Friedrich Arnold, Mo Mansouri and Matthias Finger. “Cognitive cities and intelligent urban governance,” Network Industries Quarterly Volume 13 Number 3, 2011. Mumford, Eric. The CIAM Discourse on Urbanism, 1928-1960, The MIT Press, Cambridge MA, 2002. Mumford, Lewis. The City in History: Its Origins, Its Transformations, and Its Prospects, Harcourt, Brace and World, New York, 1961. Newman, Oscar. Creating Defensible Space, US Department of Housing and Urban Development Office of Policy Development and Research, Washington DC, 1996. Patten, Bob. “Standard operating procedures in Intelligent Operations Center Version 1.5,” IBM developerWorks, 10 May 2013. Paul-Ebhohimhen, Virginia A. and Alison Avenell. “Systematic review of the use of financial incentives in treatments for obesity and overweight,” Obesity Reviews Volume 9 Issue 4, July 2008. Perrow, Charles. Normal Accidents: Living with High-Risk Technologies, Basic Books, New York, 1984. Poole, Erika Shehan, Christopher A. Le Dantec, James R. Eagan and W. Keith Edwards. “Reflecting on the invisible: understanding end-user perceptions of ubiquitous computing,” Proceedings of Ubicomp ’08, Volume 344, ACM, New York, 2008. Quigley, John M. “Urban diversity and economic growth,” Journal of Economic Perspectives Volume 12 Number 2, 1998. Reporters Without Borders. “Authorities crack down on social networks and activist bloggers,” 30 March 2012. Rider, Kenneth L. “A Parametric Model for the Allocation of Fire Companies,” RAND Institute report R-1615-NYC/HUD, April 1975. Riis, Jacob. How the Other Half Lives: Studies among the Tenements of New York, Charles Scribner’s Sons, New York, 1890. Ross, Andrew. “Human Rights, Academic Freedom, and Offshore Academics,” Academe, January 2011. Roudman, Sam. “Bank of America’s Toxic Tower,” The New Republic, 28 July 2013. Rudofsky, Bernard. Streets for People, Doubleday, New York, 1969. Sadler, Simon. Archigram: Architecture without Architecture, The MIT Press, Cambridge MA, 2005. Sen, Amartya Kumar. “The impossibility of a Paretian liberal,” Journal of Political Economy Volume 78 Number 1, January 1970. Schmidt, Harald, Kristin Voigt and Daniel Wikler. “Carrots, sticks, and health care reform: problems with wellness incentives,” New England Journal of Medicine, 4 January 2010. Schneider, Friedrich, Andreas Buehn and Claudio E. Montenegro. “Shadow Economies All over the World,” World Bank Policy Research Working Paper 5356, July 2010. Scott, James C. Seeing Like a State: How Certain Schemes to Improve the Human Condition Have Failed, Yale University Press, New Haven, 1999. Segel, Arthur I. “New Songdo City,” Harvard Business School case study 9-206-019, 15 June 2006. Siemens Corporation. “Collective Intelligence: City Cockpit, Real-Time Government,” 2011. — “Sustainable Buildings — Networked Technologies: Smart Homes and Cities,” 2008. — “What is the Siemens City of the Future?,” 2012. Simon, David, Kia Corthron, Ed Burns and Chris Collins. The Wire, Season 4, Episode 9: “Know Your Place,” first aired 12 November 2006. Smith, P.D. City: A Guidebook for the Urban Age, Bloomsbury Publishing USA, New York, 2012. Sönmez, Sevil, Yorghos Apostopoulos, Diane Tran and Shantyana Rentrope. “Human rights and health disparities for migrant workers in the UAE,” Health and Human Rights Volume 13 Number 2, 2011. Spufford, Francis. Red Plenty, Faber and Faber, London, 2011. Stallman, Richard. “Why ‘Open Source’ misses the point of Free Software,” Communications of the ACM, Volume 52 Issue 6, June 2009. Sussman, Joseph M. “Collected views on complexity in systems,” MIT Engineering Systems Division Working Paper Series, 30 April 2002. Tuan, Yi-Fu. Space and Place: The Perspective of Experience, University of Minnesota Press, Minneapolis, 1977. Vidal, John. “Masdar City – a glimpse of the future in the desert,” The Guardian, 26 April 2011. Wakefield, Jane. “Building cities of the future now,” BBC News, 21 February 2013. Webb, Flemmich. “Sustainable cities: Innovative urban planning in Singapore,” The Guardian, 11 October 2012. Weiser, Mark. “Creating the invisible interface.” ACM Conference on User Interface Software and Technology (UIST94), 1994. The White House, Office of the Press Secretary. “President Clinton: Improving the Civilian Global Positioning System (GPS),” 1 May 2000. Whyte, William H. The Social Life of Small Urban Spaces, Project for Public Spaces, New York, 1980. Wilken, Rowan. “Calculated Uncertainty: Computers, Chance Encounters, and ‘Community’ in the Work of Cedric Price,” Transformations Issue 14, March 2007. Woods, Eric. “PlanIT Valley: A Blueprint for the Smart City,” Matter Network, 31 March 2011. Woyke, Elizabeth. “Very Smart Cities,” Forbes, 3 September 2009. The following is section 4 of “Against the smart city,” the first part of The City Is Here For You To Use. Our Do projects will be publishing “Against the smart city” in stand-alone POD pamphlet and Kindle editions later on this month. UPDATE: The Kindle edition is now available for purchase. 4 | The smart city pretends to an objectivity, a unity and a perfect knowledge that are nowhere achievable, even in principle. We’ve already considered what kind of ideological work is being done when efforts like these are positioned as taking place in some proximate future. The claim of perfect competence Siemens makes for its autonomous IT systems, though, is by far the more important part of the passage. It reflects a clear philosophical position, and while this position is more forthrightly articulated here than it is anywhere else in the smart-city literature, it is without question latent in the work of IBM, Cisco and their peers. Given its foundational importance to the smart-city value proposition, I believe it’s worth unpacking in some detail. Every single aspect of this argument is problematic. — Perfectly knowable, without bias or distortion: Collectively, we’ve known since Heisenberg that to observe the behavior of a system is to intervene in it. Even in principle, there is no way to stand outside a system and take a snapshot of it as it existed at time T.
But it’s not as if any of us enjoy the luxury of living in principle. We act in historical space and time, as do the technological systems we devise and enlist as our surrogates and extensions. So when Siemens talks about a city’s autonomous systems acting on “perfect knowledge” of residents’ habits and behaviors, what they are suggesting in the first place is that everything those residents ever do — whether in public, or in spaces and settings formerly thought of as private — can be sensed accurately, raised to the network without loss, and submitted to the consideration of some system capable of interpreting it appropriately. And furthermore, that all of these efforts can somehow, by means unspecified, avoid being skewed by the entropy, error and contingency that mark everything else that transpires inside history. Some skepticism regarding this scenario would certainly be understandable. It’s hard to see how Siemens, or anybody else, could avoid the slippage that’s bound to occur at every step of this process, even under the most favorable circumstances imaginable. However thoroughly Siemens may deploy their sensors, to start with, they’ll only ever capture the qualities about the world that are amenable to capture, measure only those quantities that can be measured. Let’s stipulate, for the moment, that these sensing mechanisms somehow operate flawlessly, and in perpetuity. What if information crucial to the formulation of sound civic policy is somehow absent from their soundings, resides in the space between them, or is derived from the interaction between whatever quality of the world we set out to measure and our corporeal experience of it? What about those human behaviors, and they are many, that we may for whatever reason wish to hide, dissemble, disguise, or otherwise prevent being disclosed to the surveillant systems all around us? “Perfect knowledge,” by definition, implies either that no such attempts at obfuscation will be made, or that any and all such attempts will remain fruitless. Neither one of these circumstances sounds very much like any city I’m familiar with, or, for that matter, would want to be. And what about the question of interpretation? The Siemens scenario amounts to a bizarre compound assertion that each of our acts has a single salient meaning, which is always and invariably straightforwardly self-evident — in fact, so much so that this meaning can be recognized, made sense of and acted upon remotely, by a machinic system, without any possibility of mistaken appraisal. The most prominent advocates of this approach appear to believe that the contingency of data capture is not an issue, nor is any particular act of interpretation involved in making use of whatever data is retrieved from the world in this way. When discussing their own smart-city venture, senior IBM executives argue, in so many words, that “the data is the data”: transcendent, limpid and uncompromised by human frailty. This mystification of “the data” goes unremarked upon and unchallenged not merely in IBM’s material, but in the overwhelming majority of discussions of the smart city. But different values for air pollution in a given location can be produced by varying the height at which a sensor is mounted by a few meters. Perceptions of risk in a neighborhood can be transformed by altering the taxonomy used to classify reported crimes ever so slightly. And anyone who’s ever worked in opinion polling knows how sensitive the results are to the precise wording of a survey. The fact is that the data is never “just” the data, and to assert otherwise is to lend inherently political and interested decisions regarding the act of data collection an unwonted gloss of neutrality and dispassionate scientific objectivity. The bold claim of perfect knowledge appears incompatible with the messy reality of all known information-processing systems, the human individuals and institutions that make use of them and, more broadly, with the world as we experience it. In fact, it’s astonishing that anyone would ever be so unwary as to claim perfection on behalf of any computational system, no matter how powerful. — One and only one solution: With their inherent, definitional diversity, layeredness and complexity, we can usefully think of cities as tragic. As individuals and communities, the people who live in them hold to multiple competing and equally valid conceptions of the good, and it’s impossible to fully satisfy all of them at the same time. A wavefront of gentrification can open up exciting new opportunities for young homesteaders, small retailers and craft producers, but tends to displace the very people who’d given a neighborhood its character and identity. An increased police presence on the streets of a district reassures some residents, but makes others uneasy, and puts yet others at definable risk. Even something as seemingly straightforward and honorable as an anticorruption initiative can undo a fabric of relations that offered the otherwise voiceless at least some access to local power. We should know by now that there are and can be no Pareto-optimal solutions for any system as complex as a city. — Arrived at algorithmically: Assume, for the sake of argument, that there could be such a solution, a master formula capable of resolving all resource-allocation conflicts and balancing the needs of all a city’s competing constituencies. It certainly would be convenient if this golden mean could be determined automatically and consistently, via the application of a set procedure — in a word, algorithmically. In urban planning, the idea that certain kinds of challenges are susceptible to algorithmic resolution has a long pedigree. It’s already present in the Corbusian doctrine that the ideal and correct ratio of spatial provisioning in a city can be calculated from nothing more than an enumeration of the population, it underpins the complex composite indices of Jay Forrester’s 1969 Urban Dynamics, and it lay at the heart of the RAND Corporation’s (eventually disastrous) intervention in the management of 1970s New York City. No doubt part of the idea’s appeal to smart-city advocates, too, is the familial resemblance such an algorithm would bear to the formulae by which commercial real-estate developers calculate air rights, the land area that must be reserved for parking in a community of a given size, and so on. Even beyond whatever doubts we may harbor as to the ability of algorithms constructed in this way to capture urban dynamics with any sensitivity, the element of the arbitrary we see here should give us pause. Given the significant scope for discretion in defining the variables on which any such thing is founded, we need to understand that the authorship of an algorithm intended to guide the distribution of civic resources is itself an inherently political act. And at least as things stand today, neither in the Siemens material nor anywhere else in the smart-city literature is there any suggestion that either algorithms or their designers would be subject to the ordinary processes of democratic accountability. — Encoded in public policy, and applied transparently, dispassionately and in a manner free from politics: A review of the relevant history suggests that policy recommendations derived from computational models are only rarely applied to questions as politically sensitive as resource allocation without some intermediate tuning taking place. Inconvenient results may be suppressed, arbitrarily overridden by more heavily-weighted decision factors, or simply ignored. The best-documented example of this tendency remains the work of the New York City-RAND Institute, explicitly chartered to implant in the governance of New York City “the kind of streamlined, modern management that Robert McNamara applied in the Pentagon with such success” during his tenure as Secretary of Defense (1961-1968). The statistics-driven approach that McNamara’s Whiz Kids had so famously brought to the prosecution of the war in Vietnam, variously thought of as “systems analysis” or “operations research,” was first applied to New York in a series of studies conducted between 1973 and 1975, in which RAND used FDNY incident response-time data to determine the optimal distribution of fire stations. Methodological flaws undermined the effort from the outset. RAND, for simplicity’s sake, chose to use the time a company arrived at the scene of a fire as the basis of their model, rather than the time at which that company actually began fighting the fire; somewhat unbelievably, for anyone with the slightest familiarity with New York City, RAND’s analysts then compounded their error by refusing to acknowledge traffic as a factor in response time. Again, we see some easily-measured value used as a proxy for a reality that is harder to quantify, and again we see the distortion of ostensibly neutral results by the choices made by an algorithm’s designers. But the more enduring lesson for proponents of data-driven policy has to do with how the study’s results were applied. Despite the mantle of coolly “objective” scientism that systems analysis preferred to wrap itself in, RAND’s final recommendations bowed to factionalism within the Fire Department, as well as the departmental leadership’s need to placate critical external constituencies; the exercise, in other words, turned out to be nothing if not political. The consequences of RAND’s intervention were catastrophic. Following their recommendations, fire battalions in some of the most vulnerable sections of the city were decommissioned, while the department opened other stations in low-density, low-threat areas; the spatial distribution of firefighting assets remaining actually prevented resources from being applied where they were most critically needed. Great swaths of the city’s poorest neighborhoods burned to the ground as a direct result — most memorably the South Bronx, but immense tracts of Manhattan and Brooklyn as well. Hundreds of thousands of residents were displaced, many permanently, and the unforgettable images that emerged fueled perceptions of the city’s nigh-apocalyptic unmanageability that impeded its prospects well into the 1980s. Might a less-biased model, or a less politically-skewed application of the extant findings, have produced a more favorable outcome? This obviously remains unknowable…but the human and economic calamity that actually did transpire is a matter of public record. Examples like this counsel us to be wary of claims that any autonomous system will ever be entrusted with the regulation and control of civic resources — just as we ought to be wary of claims that the application of some single master algorithm could result in an Pareto-efficient distribution of resources, or that the complex urban ecology might be sufficiently characterized in data to permit the effective operation of such an algorithm in the first place. For all of the conceptual flaws we’ve identified in the Siemens proposition, though, it’s the word “goal” that just leaps off the page. In all my thinking about cities, it has frankly never occurred to me to assert that cities have goals. (What is Cleveland’s goal? Karachi’s?) What is being suggested here strikes me as a rather profound misunderstanding of what a city is. Hierarchical organizations can be said to have goals, certainly, but not anything as heterogeneous in composition as a city, and most especially not a city in anything resembling a democratic society. By failing to account for the situation of technological devices inside historical space and time, the diversity and complexity of the urban ecology, the reality of politics or, most puzzlingly of all, the “normal accidents” all complex systems are subject to, Siemens’ vision of cities perfectly regulated by autonomous smart systems thoroughly disqualifies itself. But it’s in this depiction of a city as an entity with unitary goals that it comes closest to self-parody. If it seems like breaking a butterfly on a wheel to subject marketing copy to this kind of dissection, I am merely taking Siemens and the other advocates of the smart city at their word, and this is what they (claim to) really believe. When pushed on the question, of course, some individuals working for enterprises at the heart of the smart-city discourse admit that what their employers actually propose to do is distinctly more modest: they simply mean to deploy sensors on municipal infrastructure, and adjust lighting levels, headway or flow rates to accommodate real-time need. If this is the case, perhaps they ought to have a word with their copywriters, who do the endeavor no favors by indulging in the imperial overreach of their rhetoric. As matters now stand, the claim of perfect competence that is implicit in most smart-city promotional language — and thoroughly explicit in the Siemens material — is incommensurate with everything we know about the way technical systems work, as well as the world they work in. The municipal governments that constitute the primary intended audience for materials like these can only be advised, therefore, to approach all such claims with the greatest caution. Siemens Corporation. “Sustainable Buildings — Networked Technologies: Smart Homes and Cities,” Pictures of the Future, Fall 2008. For example, in New York City, an anonymous survey of “hundreds of retired high-ranking [NYPD] officials” found that “tremendous pressure to reduce crime, year after year, prompted some supervisors and precinct commanders to distort crime statistics” they submitted to the centralized COMPSTAT system. Chen, David W., “Survey Raises Questions on Data-Driven Policy,” The New York Times, 08 February 2010. Simon, David, Kia Corthron, Ed Burns and Chris Collins, The Wire, Season 4, Episode 9: “Know Your Place,” first aired 12 November 2006. Fletcher, Jim, IBM Distinguished Engineer, and Guruduth Banavar, Vice President and Chief Technology Officer for Global Public Sector⁠, personal communication, 08 June 2011. Migurski, Michal. “Visualizing Urban Data,” in Segaran, Toby and Jeff Hammerbacher, Beautiful Data: The Stories Behind Elegant Data Solutions, O’Reilly Media, Sebastopol CA, 2012: pp. 167-182. See also Migurski, Michal. “Oakland Crime Maps X,” tecznotes, 03 March 2008. See, as well, Sen’s dissection of the inherent conflict between even mildly liberal values and Pareto optimality. Sen, Amartya Kumar. “The impossibility of a Paretian liberal.” Journal of Political Economy Volume 78 Number 1, Jan-Feb 1970. Forrester, Jay. Urban Dynamics, The MIT Press, Cambridge, MA, 1969. See Flood, Joe. The Fires: How a Computer Formula Burned Down New York City — And Determined The Future Of American Cities, Riverhead Books, New York, 2010. See, e.g. Bettencourt, Luís M.A. et al. “Growth, innovation, scaling, and the pace of life in cities,” Proceedings of the National Academy of Sciences, Volume 104 Number 17, 24 April 2007, pp. 7301-7306. Rider, Kenneth L. “A Parametric Model for the Allocation of Fire Companies,” New York City-RAND Institute report R-1615-NYC/HUD, April 1975; Kolesar, Peter. “A Model for Predicting Average Fire Company Travel Times,” New York City-RAND Institute report R-1624-NYC, June 1975. See the Amazon interview with Fires author Joe Flood.